An article on the BBC news website drew me to look at St. Helena, a tiny Island in the South Atlantic which they refer to as "the world's remotest island." Just 4255 (or 7637 depending on whether you believe wikipedia or the BBC) people live on the island. In many ways, life on the island sounds idyllic. On other ways it does not. I can see why people leave, but also see why others might want to take their place. So, why is this on a cycling blog ? Well, there's a video on the BBC site which includes interviews with school children. The boy on the video at 1:28 talks about the some of the issues that people face on the island. He says "...people getting 4000 - 5000 pounds per year as their salary, and that's to pay for food which is 2-3 times the price of the UK, to run a car with petrol one and a half times the price..."
Hang on, I thought. A car surely isn't actually a necessity. It's really a tiny place. In fact, St. Helena has a total area only 50% greater than that of the city of Assen where we live. It's perfectly possible to live here without a car, so surely that's also true of St. Helena. Because the island is just 16 x 8 km in size, the maximum distance anyone can possibly travel to get to anywhere else on the island is shorter than the distance that some school children from villages around here ride daily to get to school. St. Helena's climate would appear to be very agreeable too. It apparently doesn't drop below about 15 C (59 F) in the winter, so no cycling on ice as we have to do here. However, the BBC also refer to the island as "where Ford Escorts go to die." Could it really be true that a place so small is so infested with car culture that no-one considers that there is a different way of getting about ? I took a look around the web to see if I can find any evidence that anyone rides a bike there. Surely a bicycle would also be a practical way of getting around this place. However, neither the government website nor tourism website actually refer to bicycles at all. In fact, I didn't manage to find a single reference to anyone riding a bike on this island, ever. Very strange indeed. I do hope I'm wrong about this - contributions from those who regularly cycle around the island would be very interesting to hear about. If nothing else, perhaps cycling could be something else to offer on the tourism site. It does sound like a fascinating place to visit. Anyhow, back to bikes, could it be that cycling is a bit difficult over there, as the island is nothing but peaks and valleys? Just look at the little red triangles on the map. And I suppose there are a lot of gales, too. No fun. St Helena is volcanic and hilly - quite arid in many places, with plenty of scree. There's actually very little flat ground at all. hi, have been following ur blog for a month, and v enjoyable it is. as for cycling in st helena, i bet, like all islands, it is hilly. no one likes to cycle up hill. Did your research on this island include a look at a topographical map? I don't think a ship load of Dutch bicycle bloggers would lament the lack of bikes if shipwrecked there. In addition to "perceived safety" you should add "perceived ease" as condition for promoting cycling. From the looks of Helena's map most rides would be require pushing the bike up a steep hill one way and screaming down a hill with brakes fully engaged on the way back. The highest elevation on that smallish island (818m) is over twice the highest elevation in the Netherlands (322m). That doesn't leave much room for gentle slopes. One site I found writes about "deeply incised valleys" and "300m cliffs". A little Dutch infrastructure would do wonders for them (I'm thinking, suspension bridges spanning valleys, that sort of thing) but these things cost money. If you look at a topo map of St Helena, you'll notice that it is a very, very hilly island as well as quite windy. I like your blog by the way and have been a reader for a couple of years now. The town I live in in central California has a reasonably decent bicycle infrastructure for the US. Mostly because of the University, CSU Chico which is located in the center of town. However, I drool whenever you post photos of all those dedicated bicycle paths. It will be a decade or two before we're that advanced! This Google Maps terrain view is one reason why you won't be riding across the island a lot of times. Mind you if you switch to the "road" view you will see that there are only 2 communities with only a few roads. Not very far to drive at all. "All roads inland from Jamestown lead uphill, and are narrow, demanding careful driving. There are 52 miles of surfaced roads, covering most of the island: the speed limit is 30 MPH, but this is difficult to exceed in places. Many of the hills are long and steep, and it is difficult to get into high gear. There are 1,200 motor vehicles, and petrol (gasoline) is relatively expensive." 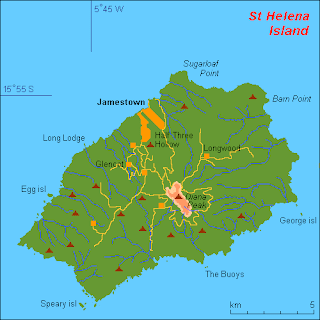 St Helena is a volcanic island the highest point is over 800 metres above sea level. I have never visited St. Helena, but have visited similar islands. The roads are extremely narrow and the grades very steep. I suspect that the road grades exceed 15% in many places. Not exactly cycling unless you are a mountain specialist. You could always send an email to the local government and ask them about the use of cars on the island? Worse yet, on their "getting around page" cycling is ignored and one of the photos shows a road with a "bicycles forbidden" sign. Looks like car culture has a colony firmly under its thumb. Walk, drive or enjoy a guided tour...either way, after taking in the wonderful Georgian inspired town, you must venture out into the country and coastal areas to appreciate such amazing contrasts in such a small world. Looks like bikes are banned from the one and only town on St. Helena. "Forget about doing the bicycle thing, as they roads are dangerously steep and bikes are not allowed in Jamestown." To all those mentioning hills - I did know you'd say that. However, once upon a time, including when Napoleon was there, there were no cars, and people managed to live on the island without them. I don't actually believe that hills in and of themselves are that big a deal for cyclists. While you do have to struggle to get up steep hills, you also get a "free ride" down the other side. With low gears and good brakes it's a lot quicker than walking, even if you push up the hill. While MTBs are far from the best choice as commuters in many of the world's cities, they could have been invented for this place. What's more, St. Helena's distances really are very short. One of the correspondents on the BBC website refers to her annual holiday when living there as being "a 15 mile drive around the island." Average journey lengths are going to be short here. Unfortunately, Kevin's observation of the "no cycling" sign and then the point that "bikes are not allowed" would seem to indicate that there really is anti-bike sentiment in this place. If true, it's rather a shame. St. Helena was originally claimed by the Dutch. I wonder if it would be any different now if it had been settled by the Dutch instead of by the British ? "if settled by the Dutch..." I doubt it. St. Maarten is half Dutch and half French and there is little or no cycling infrastructure on that island. Again it is a very steep topography, narrow winding roads and very car centric, and that is on both sides of the island, Dutch and French. In the town of Marigot (French side) I did see a few youngsters on BMX bikes playing in traffic. The one or two adults I saw on bikes were riding slowly along the sidewalk. Are there any cities in the Alps that are cycle oriented? Places that were settled by the Dutch, such as South Africa, are not exactly beacons of cycle culture. Closer to The Netherlands, the Dutch part of Belgium is notoriously cycling-hostile. Crossing the border between The Netherlands and Dutch Belgium one notices an immediate and abrupt decline in the quality of cycle infrastructure. This leads to the conclusion that a high cycle usage rate isn't about Dutch culture. It is about infrastructure and a government that is supportive of infrastructure to support cycle use. Which leads to the further conclusion that high cycle rates are achievable anywhere. All one needs is the right infrastructure and a government that provides supportive laws, education and policing. "Closer to The Netherlands, the Dutch part of Belgium is notoriously cycling-hostile." Erm, I don't think so! The cycling infrastructure in and around Ghent, Bruges, and along the coast is outstanding when compared to the facilities in the UK. "The cycling infrastructure in and around Ghent, Bruges, and along the coast is outstanding when compared to the facilities in the UK." That's like saying that my living facilities are outstanding compared with those that prevailed in The Black Hole of Calcutta. The comparison that I made was between cycling facilities in The Netherlands and those immediately across the border in Dutch Belgium. Crossing the border, one notices an immediate and abrupt decline in the quality of cycle infrastructure. In other words, it is not about Dutch culture, since two Dutch peoples living side-by-side have such a radically different quality of cycle infrastructure. It is about infrastructure and supportive government policies, laws, policing and education. These are things that every country can do. And yes, I agree with one part of the comment. Cycle infrastructure in Flanders may be bad, but in the UK it is much, much worse. hi, i m glad u pointed out the flaw in his comparison with uk. i would like to posit another reason why cycling is so popular in netherlands, apart from the better infrastructure. here in london, i find i am cycling more now since they increase the bus fares so much (by 20%). what i want to know is are the bus, train, fares in netherlands high enough to make it very cost saving to cycle instead? the funny thing about high fares, is that it makes u want to cycle because the savings are so much more when they increase the fare. here, london's lack of infrastructure was not very important in making me cycle more. after all, as a cyclist it might be nicer to have cycle paths, but if it makes the journey longer using cycle paths than the main road, i will take the main road. and it is no more dangerous than using the dedicated cycle paths which may or may not be separated from the traffic. but maybe it is just me. what do others think? Kevin: You're absolutely right about the quality of Dutch vs. Belgian cycling provision. On crossing the border there is a distinct difference. Enough, in my view, to explain why it is that the Belgians cycles less than a third as much as the Dutch. It's also true that just about anywhere compares well with the UK. Cycle paths here are very frequently more direct than the roads. My commute, for instance, would be longer by car, and would involve a lot more traffic lights if I was to do it by car (there is one set on my cycle route, and it defaults to green for bikes. There are six sets by car before I've even left Assen). Britain's attempts at cycling infrastructure may well put you in less than ideal, and sometimes dangerous situations. That isn't the case here either. It leads to a level of convenience and subjective safety which gets everyone to cycle. @Kevin... I apologise for offending your sensibilities so severely. I did not intend to offend anybody at all. However I maintain my comparison between the cycling infrastructure in Belgium and that in the UK. It is hardly an offensive thing to write or to say. You certainly did not offend me, and I apologise if my comments were so poorly worded as to convey that impression. I actually agree with what you wrote: Cycling in Belgium is much better than in the UK. But this is not because things are good in Belgium, but because they are so incredibly bad in the UK. In short, a much better benchmark for comparison of cycle infrastructure is The Netherlands and not the UK. "The joy of cycling even in the largest Swiss cities is that the bicycle is regarded as a legitimate and separate ingredient in the cocktail of road users, rather than just being seen as a wayward pedestrian or an inferior motor vehicle. So for cyclists there are separate lanes, which have been laid out so that you can cross cities safely and enjoyably, seeing them at just the right pace. These lanes interlace, on the fringes of towns and cities, with a network of countryside bike paths. Some are in noisy proximity to main roads, but it is rarely difficult to strike off in a perpendicular direction to leave the traffic behind." Even if it does not match the Dutch infrastructure there is no dearth of cycling in the Alps. The cyclists aren't all young and beautiful. Where people WANT to ride, they ride. Hills aren't an issue, they're an excuse. Kevin, Peter: Google Street maps provides a good few examples of what the cycle paths are like at the Belgian / Dutch borders. In my experience the difference are quite stark even right at the border. Take a look here, here, and here. In each case you'll have to turn on the spot using Google Street View, so you see both sides of the border.